Now I saw in my dream, that thus they sat talking together until supper was ready. So when they had made ready, they sat down to meat. 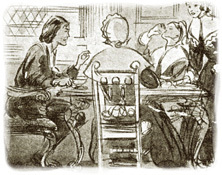 Now the table was furnished “with fat things, and with wine that was well refined.” And all their talk at the table was about the Lord of the hill; as, namely, about what He had done, and wherefore He did what He did, and why He had built that house. And by what they said, I perceived that He had been a great warrior, and had fought with and slain “him that had the power of death,” but not without great danger to Himself, which made me love Him the more. For, as they said, and as I believe (said Christian), He did it with the loss of much blood; but that which put glory of grace into all He did, was, that He did it out of pure love to His country. And besides, there were some of them of the household that said they had been and spoke with him since He did die on the cross; and they have attested that they had it from His own lips, that He is such a lover of poor pilgrims, that the like is not to be found from the east to the west. They, moreover, gave an instance of what they affirmed, and that was, he had stripped Himself of His glory, that He might do this for the poor; and that they heard Him say and affirm, “that He would not dwell in the mountain of Zion alone.” They said, moreover, that He had made many pilgrims princes, though by nature they were beggars born, and their original had been the dunghill. After Prudence, Piety and Charity question Christian and examine his life and testimony, the family comes together for a meal. From its earliest days the church “continued steadfastly in the apostles’ doctrine and fellowship, in the breaking of bread, and in prayers” (Acts 2:42). The meal at Palace Beautiful represents the fellowship that believers share together in Christ, especially in the regular observance of the Lord’s Supper. Jesus is the Master Builder of Palace Beautiful (Matthew 16:18) and its Chief Cornerstone (Ephesians 2:20). He is the Great Warrior who took on flesh and stood in our place, defeating death and triumphing over the evil one. At the supper we are reminded that it is Jesus who redeemed us by His shed blood and broken body on the cross. And He took bread, gave thanks and broke it, and gave it to them, saying, “This is My body which is given for you; do this in remembrance of Me.” Likewise He also took the cup after supper, saying, “This cup is the new covenant in My blood, which is shed for you” (Luke 22:19-20). It is Jesus who brings us near to God. But now in Christ Jesus you who once were far off have been brought near by the blood of Christ (Ephesians 2:13). For I delivered to you first of all that which I also received: that Christ died for our sins according to the Scriptures, and that He was buried, and that He rose again the third day according to the Scriptures, and that He was seen by Cephas, then by the twelve. After that He was seen by over five hundred brethren at once, of whom the greater part remain to the present, but some have fallen asleep. After that He was seen by James, then by all the apostles. Then last of all He was seen by me also, as by one born out of due time (1 Corinthians 15:3-8). Now before the Feast of the Passover, when Jesus knew that His hour had come that He should depart from this world to the Father, having loved His own who were in the world, He loved them to the end (John 13:1). He is able to raise up a beggar to be a prince. At every point in Bunyan’s description of the supper at Palace Beautiful our attention is drawn to Christ. Jesus is at the heart of the love and joy we share together in the church. Our fellowship is in Him (1 Corinthians 1:9; 1 John 1:3). It is He who rescues us from sin and makes us sons and daughters of His Kingdom. Our lives display the power of His gospel as trophies of His grace and mercy. The table reminds us that we never get beyond our need for the gospel. We need to keep it on our lips and ringing in our ears. It is Jesus we remember as we proclaim His death till He comes (1 Corinthians 11:25-26).